This is the week where multiple movies I meant to see in theaters come to DVD, and I didn't manage to get the review copies of any of them. Could it be that I'll actually use Netflix to send me movies, and not just as an "Instant Viewing While I'm At Work" service? 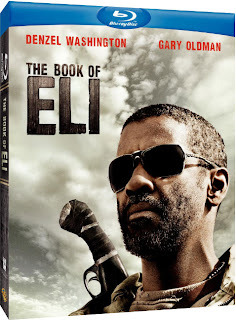 The Book of Eli: Several January theatrical releases hit this week, and the January release date is usually a big ol' red flag for a stinker that wasn't strong enough to open in the fall. But Denzel's latest "off-beat actioner" got surprisingly decent reviews, and it's got Gary Oldman and Mila Kunis in supporting roles, so what the hell have you got to lose? Youth In Revolt: Michael Cera is at a bit of a crossroads, stuck between the stammering-adolescent roles that he plays so well and the fear of being typecast. Here, he faces that dilemna head-on, playing both a "Cera type" and his smooth, mustachioed alter ego. Director Miguel Arteta (The Good Girl) is always up to something interesting, and DVD Talk's usually-reliable Jamie S. Rich gives it a big thumbs-up. When in Rome: There are few young actors I harbor as much good will for as Kristen Bell--she's got great comic timing, she projects effortless braininess, and yes, she's insanely hot. So I'm all for her becoming a movie star, but hew lord, the trailers for this one look terrible, and the reviews were downright brutal. Can we just get that Veronica Mars movie made, already? Lewis Black- Stark Raving Black: It's not Lew's best special; like it or not, he lost his greatest satricial target in January of 2009, and here tries to branch beyond his usual political specialties with more personal narratives. I admire Black's desire to try new kinds of material, but he's at his best in the second half, doing what he made his name on: fiercely intelligent, sharply pointed topical comedy. Collapse: A fascinating, troubling, and memorable (if somewhat derivative) documentary portrait of former cop and investigative journalist Michael Ruppert, who's either totally out of his mind or warning us of impending doom and danger. Or, perhaps, both. Mary and Max: This unexpected oddity--a feature-length claymation film with the dark humor and biting edge of a 1970s relationship movie like Harold and Maude or Thieves Like Us--is funny, poignant, and rather sad and beautiful. You'll have to track it down, but it's worth the effort. Mystery Train (Criterion): It's been a good decade and a half since I saw Jim Jarmusch's low-key growler of a triptych picture, telling three tales of love and desperation in a dingy Memphis hotel. But it was my introduction to the filmmaker (and to the title song), and DVD Talk's Bill Gibron says it holds up--and that Criterion's Blu-ray presentation is great-looking and loaded with quality supplements. The Stepfather (Blu-ray): I haven't seen how it looks on Blu (Adam Tyner says it's a "good but not great" transfer), but I finally got around to seeing this one a few months back, mostly based on Pauline Kael's surprising rave for it. While it's got its flaws (the actress who plays the stepdaughter is so terrible, I couldn't figure out how she got cast--until they got to the shower scene), it's a mighty good slow-burn thriller, patiently building the fear and dread, and is blessed by a brilliant star turn by Terry O'Quinn.